I still remember the first time I read about achiote paste. I just remember thinking, “where in blue blazes are we going to find that? !” Apparently it’s quite the popular thing in Mexican cuisine because we were able to find it not only at our local Mexican grocer but since then I’ve even seen it at a New Seasons and a Safeway. Knowing that it’s the hardest thing to come by for this grilled recipe, there’s really nothing holding you back, aside from maybe finding the perfect pineapple (although that’s a story all its own). 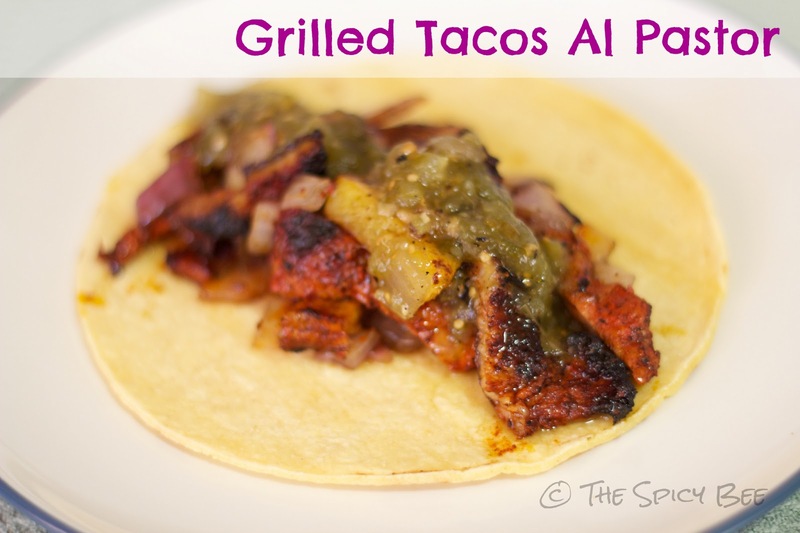 Al pastor is a similar way of cooking as the Lebanese shawarma style of cooking brought by immigrants to Mexico. You may also find it similar to one of my favorite European street vendor delights, the Turkish doner kebab or Greek gyros. I always find it interesting how a style of cooking or a dish could be adapted and changed to meet the needs of its people. Get some lamb, chicken, beef or pork into a flat bread or tortilla and top with some complementary toppings found traditionally within the culture. Sort of funny, isn’t it? This recipe, created by the awe-inspiring Rick Bayless himeself, is in Ktam’s top 3 of all time. Grilled over charcoal, these tacos are immensely flavorful and pack a deep, smokey punch. 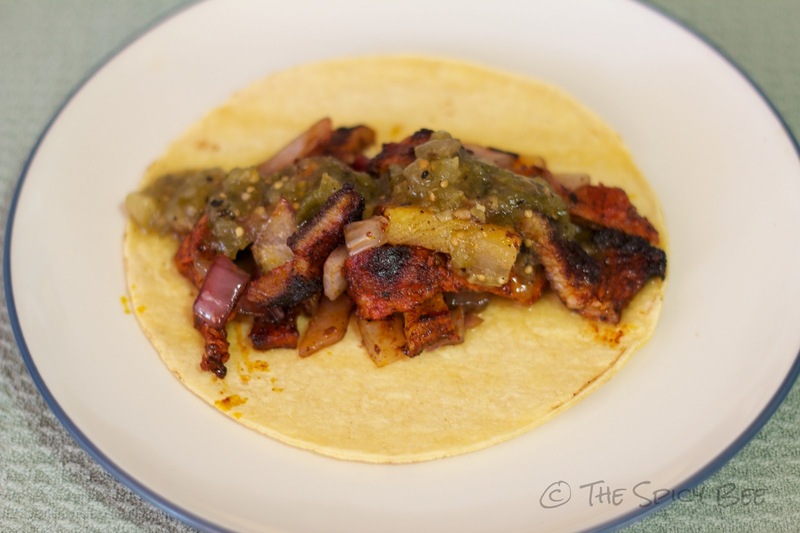 Things to be careful about are under- or over-toasted corn tortillas, as well as making sure the achiote is thoroughly mixed into the marinade or you’ll start having flashbacks to childhood and Nesquik (Dane Cook…no? Nevermind). I’ve already scared you out of trying this haven’t I? Well the brave will want to hi-five me in their glorious victory that is completing this recipe. Come on, what have you got to lose? Add achiote paste, canning sauce, chiles, 3/4 c water, and olive oil, blending until smooth. NOTE: be diligent in your blending otherwise you will end up with pockets of unblended achiote…and that’s gross. Take 1/3 of the marinade, and cover both sides of meat. Refrigerate for at least 1 hour. You will find that you have approximately 2/3 of the marinade left over–this can be added in small amounts to the meat as you grill or you may freeze the marinade for later use on other fish or meat dishes. 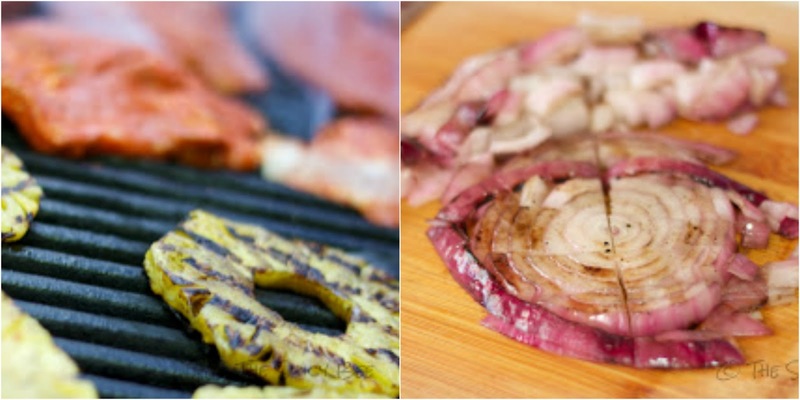 When ready, fire up the grill, and cook the meat, onion, and pineapple (be sure to brush onion and pineapple with oil before placing on the grill). The meat will take approximately 1 minute per side, and the fruits and veggies should be grilled over high heat until lightly charred on the outside or slightly softened in the case of the onion. Chop the onion and pineapple up after grilling, and toss together with the pork. Season to taste with salt and serve on warmed tortillas with the tomatillo salsa. Serves 4-5. This recipe is gluten and dairy free!